Look Out MySpace…The Censors Are Coming! It was bound to happen. MySpace already “filters” copy righted music and now it’s turning it’s focus to copy righted video. Or so it says. This just seems ripe to mess up the average Joe user who may “sample” a bit of video into their own video. 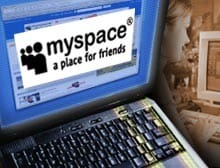 In the video-filtering pilot, MySpace said it would block unauthorized music videos and other clips containing Universal Music Group’s music, while still allowing the Vivendi SA unit and its artists to circulate promotional audio and video they authorize. 70% of websites at immediate risk of being hacked!